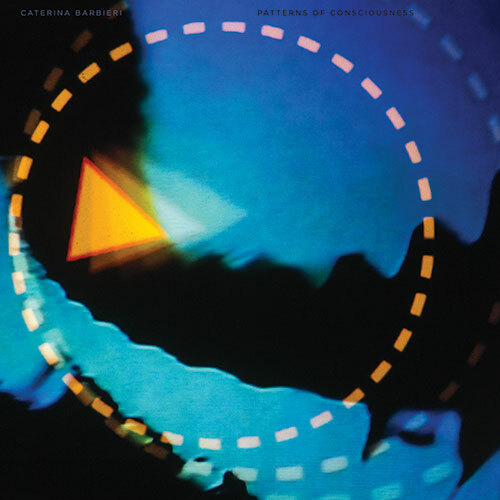 It’s no surprise that Italian-born composer Caterina Barbieri started out as a student of classical guitar. Her ability to describe sound with a deftness of touch and internal momentum, by synthesis alone, is abundantly clear on her second full-length 2LP Patterns of Consciousness. Barbieri’s sublimation into Berlin’s vibrant music scene also offers clues as to the origin of this compelling electronic work. What’s immediately apparent is the impression that you’re listening to a very small grouping of sounds. There is nothing beyond a few layers responding to and adapting around each other. With no sense of a recording space, it all grows out the thick black of airless silence. As its title suggests, Patterns of Consciousness presents simple forms that interlock with each other at various speeds and in different textures to reveal a beautiful mirage. The sonic Lego that Barbieri employs is like an echo of Folke Rabe’s monumental What? The music is built from cold, hard, and wholly unnatural sounds that acquire real emotional beauty despite their inorganic form. With recorded music like this, the only human element is the listener, but its power is manifest in that our brains perceive warmth, exhilaration, and raw emotion in this manipulation of purely artificial sound. I’m an avid listener that can’t play a note on any instrument. I decided a long time ago (knowing the way my brain works), having an understanding of how sound is made, I’d try and unravel music rather than just listen. So the fact Barbieri deploys an Indexed Quad Sequencer and a Harmonic Oscillator doesn’t make my understanding of what she is doing particularly vital to my enjoyment. I have no idea what either does, beyond allowing pure electronic sound to be precisely organized into wonderfully kaleidoscopic patterns. The album cuts into the moment with This Causes Consciousness to Fracture. There is no fade in: it simply enters the room like a ringtone framed in space. The track develops slowly as echoes begin to overlap. Primitive video games and the ghost of techno bounce around in your imagination. As the sound slowly changes focus, the spectre of a modified string quartet with little squeaks of cleaning glass looms out the framework. TCCTF focuses in on far smaller, densely circling tones—the sound of a Venn diagram slowly matching and unmatching. It’s a formula echoed in the two other tracks named in uppercase—the dreamy INTCAEB, and the glorious, corroded SOTRS. The calm works as a perfect contrast to Information Needed to Create an Entire Body. Again, we have simple interlocking figures working like psychedelic pistons. Traces of Terry Riley’s organ work are reimagined as a spectacular nightclub monster. That it doesn’t explode only gives you time to observe all the internal gears turning in dizzying unison. This is music that makes universal sense to play loud. The album culminates in its longest track, the 16-minute-long Gravity That Binds. A massive looming pulse swells, revealing its slowly disintegrating internal organs. The track builds, only to fold in on itself and quietly unknot into silence. Patterns of Consciousness is a thoroughly enjoyable listen. Barbieri has, with a limited palette, created a very well realized, diverse, and welcoming place for your brain to engage with its intent over a full 70 minutes.